We’d love your help. Let us know what’s wrong with this preview of Waking the Sleeping Giant by Timothy Daughtry. To ask other readers questions about Waking the Sleeping Giant, please sign up. I saw this on one of Amazon's Kindle sales, the contradictory title intrigued me, and out of curiosity and amusement I picked it up from the library a week or so later. 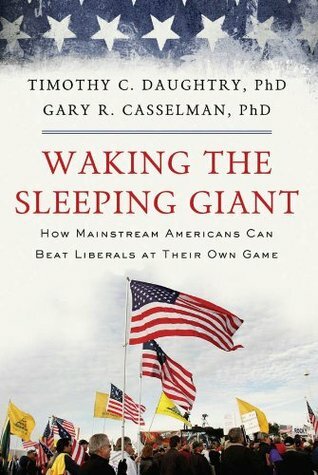 As indicated in the title, it outlines the basic differences between mainstream Americans and liberals, and how normally peace-loving, conflict-avoiding mainstreamers can stand up and combat the insidious power-hungry tactics used by the left. I knew from the title that this wasn't aimed at me, and it turned out that I fell into t I saw this on one of Amazon's Kindle sales, the contradictory title intrigued me, and out of curiosity and amusement I picked it up from the library a week or so later. As indicated in the title, it outlines the basic differences between mainstream Americans and liberals, and how normally peace-loving, conflict-avoiding mainstreamers can stand up and combat the insidious power-hungry tactics used by the left. I like this enough to recommend it but I also have qualms about it. First, a brief overview: Authors attempt to 'awaken' the sleeping giant of mainstream America to stand against anti-family and anti- absolute truth cultural and political movements. The ones often called liberals. Anyway, the book went on and on in the exact repetitive method that added to my dislike of talk radio. I scanned the entire thing to find those useful points I was looking for. I found them, mostly towards the back. Ho I like this enough to recommend it but I also have qualms about it. First, a brief overview: Authors attempt to 'awaken' the sleeping giant of mainstream America to stand against anti-family and anti- absolute truth cultural and political movements. The ones often called liberals. Anyway, the book went on and on in the exact repetitive method that added to my dislike of talk radio. I scanned the entire thing to find those useful points I was looking for. I found them, mostly towards the back. However, others may find the first two thirds of the book enlightening and really, they might just have to build a solid foundation for readers who have not already been accustomed to the cultural and educational trenches of parenting. And some of the points in the back would have been extremely useful years ago. So overall, I say this book is useful but sometimes verbose. The book has the conservative/liberal idea as its basis. I often think in those terms as well, but find them limiting. There are some conservatives who frighten me as well as some liberals. That aside, the book is worth a scan if you have experience, or a closer read if you do not. It instructs on how to counter liberal arguments that call names rather than make reasoned discourse, and things like that. It takes aim at several of the Alinsky methods of cultural and political destruction. I suppose if one took this as a learning manual, the repetition would make more sense. I've been fighting this fight and learned many of the methods en route to living a more meaningful life. And with my experience, I question some of the logic presented here, especially a few snippets towards the end in those imaginary discussions between imaginary liberals and mainstreamers, as they are referenced in the book. This needs to be addressed in more solid, classical ways: a chess game where you have more than one or two moves planned (oh they touch on this, briefly, at the end) or by using the Socratic method. The Socratic method is what I have used for years to uncover truth for myself as well as uncover it when others would bury it in an unmarked grave. It's an okay book over all. I say that as a generally conservative reader. If someone does attack it as hateful, I can only point out that this label is one of the first methods addressed in the book.